You’ll first notice gladiola scab (caused by the bacteria Pseudomonas marginata) as you dig the corms in fall. IDENTIFICATION — You’ll first notice gladiola scab (caused by the bacteria Pseudomonas marginata) as you dig the corms in fall. 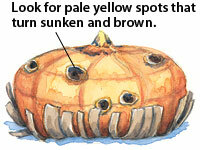 It appears as pale yellow spots that eventually turn brown and sunken. The bacteria spread by splashing water or insect feeding. CONTROL — Throw infected corms away, not on your compost pile. And before you store glad corms in fall, inspect them and get rid of any infected ones. Dry the remaining corms in a well-ventilated area out of direct sunlight for 2 to 3 weeks. Keep the temperature around 60 to 70 degrees F. Once they’re dry, store them in paper bags at 35 to 40 degrees F.
In spring, when you replant your glads, don’t overwater them, as scab spreads more easily in wet soils. Nothing says “autumn” like colorful hardy mums, but many disappear after a single season. Watch our slide show to meet five great mums that you can enjoy for more than just one year. You many not see the 5?8-in. brown or gray adult squash bugs, as they like to hide during the day.